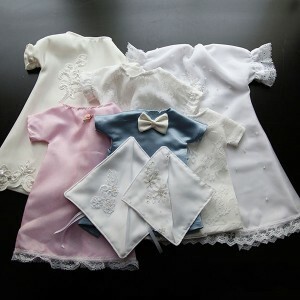 Precious Angel Gowns is a volunteer group based in Ontario who help parents who have suffered the loss of a baby in the form of burial gowns for babies born too early or still and Angel Wraps for babies lost in miscarriage. We offer free gowns/wraps to family’s so that their precious child can be clothed in something beautiful during a family’s final moments together. Each gown is sewn with love from donated wedding and formal dresses and is unique and special. We gift at absolutely no charge to Hospitals, Funeral Homes and families in Ontario and directly to families in Canada. We are currently gifting to four hospitals, one funeral home and directly to families. Please consider Donating Today to help enable us to continue giving. We are a 100% Volunteer group based in Ontario and you can feel confident that your donation is used in the preparation, packaging and delivery of our Precious Angel Gowns and Wraps. We offer free gowns to family's so that their precious child can be clothed in something beautiful during a family's final moments together.